Betsey Johnson has launched Pretty N' Punk, a new fragrance for women. 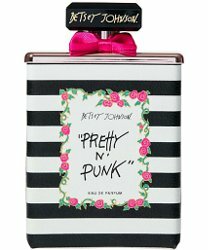 Betsey Johnson is back with a brand new scent: Pretty N' Punk! The scent plays off three of Betsey's favorite things: flowers, bubbly, and rock & roll, so purchase a bottle and let the good times rock n' roll. Unapolagetic [sic] and energetic. Pretty N' Punk is a playful collision of spicy and citrus scents with sandalswood [sic] and must [sic!] undertones, amplified by a sweet amber twist. With a vibrat [sic] burst and sultry finsih [sic] it's perfect for every Betsey babe! Additional notes include mandarin, raspberry, cherry, black pepper, cardamom, pear, gardenia, jasmine, rose, trumpet lily, heliotrope, peony, freesia, praline, white musk, benzoin, vanilla and patchouli. Betsey Johnson Pretty N' Punk is $60 for 100 ml Eau de Parfum and can be pre-ordered now at the brand website. They’re too punk to care about typos. Ha! I opened this review because I couldn’t figure out why there were so many comments. So funny! The writer clearly had one too many pinot grigios at lunch. What a mess! The errors in the copy are kind of funny, but the quotation marks around the name of the product — that took planning. It would be kind of funny and awesome at the same time if “must” was an actual note in this perfume and not a typo. The smell of brewing beer would definitely give it a punk edge! ??? ?